The outdoor temperature is rising. The time to get that pool back up and running is now! Whether you run a pool business or are a pool owner, you know how important it is to have your pool chlorinator running smoothly, all season long. But what do you do when your pool chlorinator stops working? Buying a new one might be the first thing that comes to mind. However, the problem may be easier to fix than you think and much cheaper than purchasing a new chlorinator. One of the main problems that pool chlorinators can run into is their inrush current limiter failing. There are many reasons this issue may arise; high ambient temperature* being a main one. If your pool chlorinator is installed in an area where there is little to no airflow, say underground, the ambient temperature can get very hot, adding additional heat to the body temperature of the inrush current limiter. With this excess heat, the inrush current limiter may not have enough resistance when energized to limit the inrush current, resulting in a fail. Checking to see if the fault lays with the present inrush current limiter can save you the pain of having to replace your entire chlorinating system. Whether ambient temperature is the problem or there is some other complication that may have affected your inrush current limiter, replacing this product could be the solution you need. Once you have opened the casing of the pool chlorinator, you should be able to quickly identify the faulty inrush current limiter, remove, and replace it. There is an excellent blog post by Russell Wright showing how to disassemble a typical pool chlorinator. Borrowing one of his images, you can see damage on the circuit board from the overheated inrush current limiter. This damage was caused by the steady-state current coupled with the ambient temperature, transferring heat from the body of the inrush current limiter to the lead. The lead, then acting as a heat sink, carrying this heat to the board, resulting in burn marks. Accessing your circuit board, there will be a black disk, similar to the one shown in the image above; this will be the inrush current limiter you need to replace with a new one. 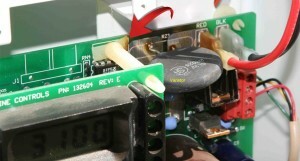 In most cases, Ametherm’s AS32 2R025 inrush current limiter will be the perfect replacement. However, the SL32 2R025 inrush current limiter may also be used. Before purchasing, you will first want to look at the electrical specification of your pool chlorinator or talk to one of our engineers, to ensure you choose the correct inrush current limiter for your specific chlorinator. Keeping in mind that pool chlorinators come in many different shapes and sizes, and this article and image above are just to reference the steps to disassemble and replace the damaged inrush current limiter. To learn more about how to select the correct NTC thermistor inrush current limiter for your pool chlorinator, check out our article on choosing the right inrush current limiter. 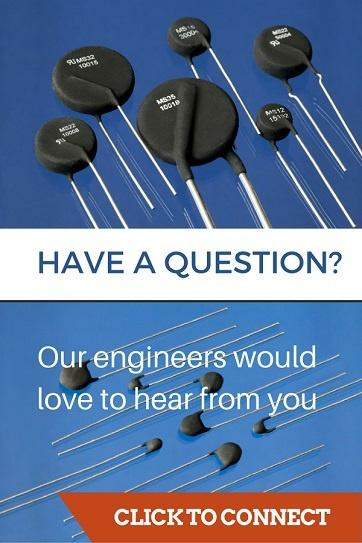 For answers to any questions that may have arisen, you can contact one of our engineers, and they can answer any inrush current limiter queries you may have. Ordering one of Ametherm’s AS32, SL32 or any other NTC thermistor inrush current limiters is easy with our trusted distributors (see chart below), or if you are outside of the US, check out our full list of distributors here. Hopefully, this will help you enjoy your current swimming season, and many more to come. *Ambient temperature is always necessary to keep in mind. Most calculations in regards to choosing the correct inrush current limiter will be base the ambient temperature being between 0ºC and 65ºC. If your environment is outside this scope, you will want to refer to a derating chart to see how to modify your calculation to ensure the best productivity out your inrush current limiters.